There’s something very nostalgic about having a drinks cabinet; a place where you can proudly store and show off your collection of well-aged whiskies, bourbons and fine wines. Rather than shoving them in the back of your kitchen cupboard and forgetting about them until Christmas rolls around, a purpose-built drinks cabinet can take pride of place in your lounge, office or man-cave, so that you can enjoy a drink whenever you fancy it, and play host to your friends with what is essentially your very own private bar – and who wouldn’t want that? Drinks cabinets have a wealth of history, and we often imagine antique-style furniture such as deep oaks and heavy mahoganies, or family heirlooms such as globes that open out to reveal a beautiful set of crystal glassware. In 2018, drinks cabinets are back in fashion, and if you think the antique style of the of the 17th and 18th century bourgeoisie isn’t really your style, jump forward to the 1920s and consider the striking look of Art Deco taking pride of place in your home – perfect for those budding mixologists looking to showcase their collection with style and sophistication. 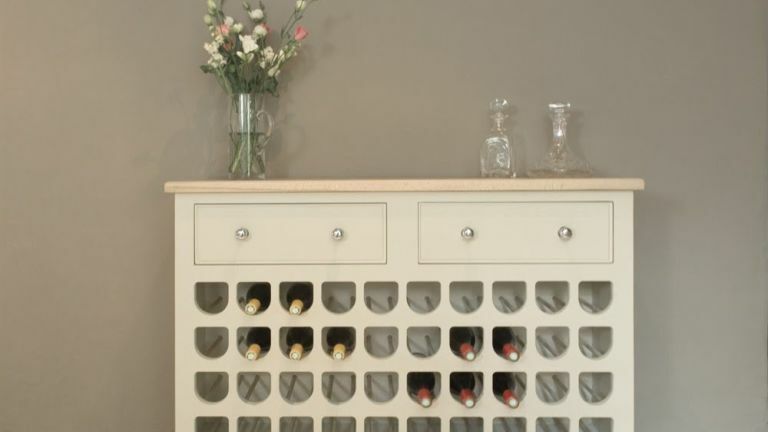 Our list features some brilliant odes to these memorable decades, with a few up-to-date, minimalist options thrown in for good measure if nostalgia isn’t your thing, but other than aesthetic value, there are a few other factors to consider when buying a drinks cabinet for your home. Firstly, how much storage space do you need? (We’re not judging you on how much you drink, honest!) If you want to store both drinks and glassware, look out for larger cabinets with different sized shelves to ensure you can fit everything in with ease, or if it’s only for your finest and favourite bottles, you may prefer to choose one with glass doors or opt for a drinks tray that will proudly display your collection at all times. So whether it’s for storing your drinks in style, or carefully holding your favourite glassware and spirits only to be brought out on a special occasion, our list takes you on a journey through the decades, featuring only the finest cabinets in which to keep your drinks. Create your very own gin bar and show off your favourite glassware in this modern take on the Gatsby era. Art Deco has made a huge comeback this year and this minimalist design wouldn’t look out of place in most dining rooms or lounges. If you often have guests over and enjoy entertaining, the Carraway Drinks Cabinet is sure to impress and it’ll make you feel like you’ve opened your very own speakeasy. Its shelves in the doors are great for displaying your favourite bottles, but be warned this does compromise the space inside when it’s closed. Pricey, yes, but a sturdy piece of kit that is bang on trend and will remain a timeless piece amongst your décor for years to come. Some may see this drinks cabinet as more of a novelty, but we think the globe drinks cabinet is a classic design that is a must-have for any and all well-travelled fellows, or, anyone who wants to feel a little posh every time they drink their booze. It’s well built, and is the perfect decoy for keeping a secret stash of bourbon in your home office for those especially stressful days (perhaps the day you assemble it, as users noted it’s not the simplest of tasks). The storage space is limited though, so it’s better for keeping only your best-loved drinks in, with a couple of glasses handy too. This solid birch drinks cabinet is a serious piece of furniture for the budding mixologist. Not only does this drinks cabinet have plenty of space for all your favourite bottles, glasses and cocktail equipment, you can transform your space into a pop up bar with the extending sides which make a table top – quite the party trick for a man cave or dining room. It’s quite big, so it’ll have to take pride of place wherever you put it, but it means that you can keep all of your best drinkware in one place, whether you use it regularly or only bring it out on occasion. Technically not a cabinet, but another unique way to display your favourite drinks, this Mid-Century Bar Cart comes in handy when entertaining guests. It has two tiers for you to store a range of spirits and glasses ready to bring out at any moment to serve anywhere. If you’re a collector of some fine whiskies and bourbons but don’t have much space for one of the bigger cabinets on the list, this quirky trolley is a great alternative that still evokes an air of nostalgia when indulging in your tipple of choice. -Huge - but that does mean more alcohol! Keep your home fully stocked with all the family’s favourite drinks in this large solid oak bar cabinet for your home. It’s huge and most likely weighs a tonne, but it has room for absolutely everything, including designated wine shelves, a glass cabinet to display all of your glasses, a wine glass rack and a fold down tray table for preparing your drinks to serve. It’s the best drinks cabinet for the family home and is built with a sturdy structure and modern design that wouldn’t look out of place in most dining rooms or lounges.